Here is the “Public Safety” wish list from the US Conference of Mayors. • Sparks, Nevada wants $600,000 to purchase a “live fire” house its SWAT team can shoot up, and another $420,000 for a SWAT armored vehicle. 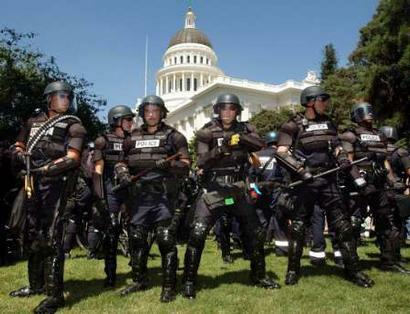 • Pleasanton, California wants $250,000 to buy a vehicle for its SWAT team. • Gary, Indiana wants $750,000 for a host of “modernization” upgrades to its police department, including “sub-automatic machine guns” and an “armored vehicl” [sic]. • Hampton, Virginia wants a whopping $3.5 million for “Air Tactical Unit Support and Equipment,” which I’m pretty sure means they want a sweet helicopter for the SWAT team. • Glendale Heights, Illinois wants $96,000 to purchase red light cameras, and another $67,000 to hire someone to monitor them. • Toward a more Orwellian America! The following cities requested stimulus funds to supplement, initiate, or upgrade public surveillance camera systems: Brockton, Massachusetts; Buffalo, New York; Burnsville, Minnesota; Caguas, Puerto Rico; Cerritos, California; Columbia, South Carolina; Compton, California; Homestead, Florida; Hormigueros, Puerto Rico; Indianapolis, Indiana; Inglewood, California; Lewiston, Maine; Lorain, Ohio; Lynn, Massachusetts; Marion, Ohio; Merced, California; New Rochelle, New York; North Richland Hills, Texas; Oakland, California; Orange, New Jersey; Orem, Utah; Orlando, Florida; Pembroke Pines, Florida; Ponce, Puerto Rico; Riverdale, Illinois; Shreveport, Louisiana; Silver City, New Mexico; Sumter, South Carolina; Tallahassee, Florida; Warren, Ohio; and Wilkes-Barre, Pennsylvania. Winston-Salem, North Carolina requested just under $85 million in security-related stimulation. But top prize goes to Tulsa, Oklahoma, which is asking the rest of the country to stimulte its economy with a whopping $135 million in public safety-related requests. The city of La Porte, Texas has applied for $700,000 to build a “Lifestyle Center” while the city of Houston wants a whopping $175,000,000 to build the “Metro Houston Intermodal Terminal” in downtown Houston. I could go on, but I am nauseated by reading these documents. Readers will have to carry on in my absence while I try to recover. ... But even when the information is widespread and available, many Americans would rather change the channel and distract themselves with the contrived drama of reality TV than consider the actual reality that their own government could behave in a manner so criminal, brutal, hypocritical, and unconstitutional. We want to believe that we are the inheritors and preservers of freedom and democracy. We want to trust that our government obeys its own laws. It's just easier that way. The sheep don't want to take time out from lazily grazing in their coach potato pastures to consider the turmoil outside the flock.